I know! I know! It’s been a couple of months since I’ve done a restaurant review. They’re a great way of connecting with past Burkett customers and see what they’re up to after we supply them. On the recommendation of Inside Sales Manager, AJ Jarouche, Balance: Pan-Asian Grille in Maumee, Ohio was selected as the featured restaurant. When I called to arrange a meeting with the owners, I spoke with Prakash Karamchandani, or PK- the marketing, advertising and branding genius behind Balance. On the day I visited the restaurant, I met with co-owner and culinary expert CJ- aka Chef Banger to learn a little more about Balance and why they chose Burkett’s as their main equipment supplier. Walking into Balance, I felt like I was transported out of Toledo. The decor is simple and open feeling- the walls are not cluttered with advertisements, and the dining area was bright and inviting. Ordering at Balance is a three part process- pick your protein (meat, tofu, chicken, or seafood), your sauce (choose from 5 different flavors), and your starch (White or Brown Rice, Fried Rice, Noodles or Fresh Greens) to create a sensational meal that leaves you feeling full and satisfied. Balance also offers Egg Roll, Won Tons, Edamame, Hot Soups, and Potstickers. Nothing washes down your meal as good as a drink from their TeaBar served hot or cold. I tried the Lychee BubbleTea served cold. It was like nothing I’ve ever tried before. The Tea was sweet and refreshing but the real kicker was the Tapioca bubbles. Delicious! You’ve really got to try it for yourself to understand what it’s all about! Their food is a healthier alternative to fast food dining- but as CJ insists, Balance is far more than your typical “healthy restaurant.” The vegetables and meats are purchased from local vendors who support organic, antibiotic and hormone free foods when possible. The chicken for example, is organic free-range and the meats are antibiotic-free and grass fed- two important aspects for healthy living. Vegetables are bought whole and chopped daily and the sauces are made from scratch. Each season, a new dish is introduced and made from fresh seasonal herbs and greens. So at this point, your probably assuming this healthy food probably lacks a lot of flavor and I’ll tell you- You couldn’t be more wrong! Chef Banger prides himself on the balanced flavors of his sauces that are prepared to compliment your dish and not sacrifice flavor. For being a “healthy” restaurant their food is also extremely affordable- ranging between $5 for a small dish and $10 for a larger portion. When Balance prepared to open its doors in February 2010 they went to Burkett Restaurant Equipment for their equipment and supplies needs. CJ’s parents, who own a restaurant in Bowling Green, Ohio are long time customers and staying with CJ and PK’s philosophy of supporting local- Burkett’s was a fitting choice. Their proximity to our warehouse and showroom allows Salesman AJ Jarouche to quickly respond to Balance when they need to restock their kitchen or if a problem arises. For example, recently a gas line broke on a piece of equipment and AJ had a new part delivered in two days. It is that kind of personalized service that CJ really appreciates. It’s clear that Balance’s food is delicious and their concept is definitely unique! So, if your looking for a healthier alternative to fast food in the Toledo area, Burkett Restaurant Equipment highly recommends Balance. In a hurry? Call ahead for pick up! Looking to cater your next event? Balance also offers catering services. Today is National Creme Brulee Day! I was never a fan of Creme Brulee until I tried it one fateful day at a French restaurant in Prague, Czech Republic at the behest of my friends. Upon eating the first bite it was truly love at first taste! The caramelized sugar and lukewarm creamy custard middle- WOW!- I couldn’t get enough! Ever since, I have made it my personal mission to try Creme Brulee at every restaurant no matter how full I am from the main dish. While the exact origins of Creme Brulee is unknown, it dates back as far as 1691. Since that time, this fabulous dessert has come a long way. Culinary geniuses have added mint, chocolate, orange, pineapple, berries and orange zest just to name a few add ins. One thing has remained the same- it’s custard filling and crispy caramel topping. Have you ever thought about serving Creme Brulee for dessert at your restaurant? You probably have most of the ingredients to make it in your kitchen anyways! Add this dish to your menu for sure fire success! We dug up a classic recipe from Creme Brulee- just add in something unique to make it your signature dessert! Preheat your Blodgett Single Deck Electric Oven (currently running a Free Shipping promotion on it!!) to 300F. Arrange 6 6-oz European Fluted Ramekins in a large pan with sides at least 1 1/2 inches deep. Whisk the egg yolks in a large bowl until they turn frothy and bright yellow. Slowly whisk 1/3 cup sugar, the creams, and vanilla extract into the beaten eggs. Beat the mixture for 90 seconds. Pour the eggs and cream through a medium-mesh sieve into a 1 Qt liquid measuring cup. Divide the mixture between 6 custard cups and fill the large pan with hot water half-way up the sides of the ramekins. Bake the custard in the hot-water bath for 55 minutes to 1 hour, until the custard is set, but still moves a bit in the center when jiggled. Cool the custard in the water bath for 20 minutes, and then refrigerate them until they are chilled. Sprinkle the remaining 1/4 cup granulated sugar over tops of the custards and caramelize the sugar with a Butane torch. Serve immediately. Never forget- a good Creme Brulee will keep customers coming back for more and more night after night! What are you going to add to make this your unique dessert dish? HOT DOG! It’s National Hot Dog Day! With all the varieties that hot dogs are available in who can seriously say they don’t enjoy eating them?? Chicken, Beef, Pork, Stuffed with Cheese, Turkey, Soy…. the possibilities are endless! So tonight for dinner grill up your favorite hot dog and get creative with the toppings! More traditional? Then stick to the classic Chicago Dog with this recipe! You can use a hot dog steamer and bun warmer combo to save time. If you don’t have that available, bring a pot of water to a boil. Reduce heat to low, place hot dog in water, and cook 5 minutes or until done. Remove hot dog and set aside. Carefully place a hot dog bun steamer basket into the pot and steam the hot dog bun 2 minutes or until warm. Place hot dog in a steamed bun. Pile on the toppings in this order: yellow mustard, sweet green pickle relish, onion, tomato wedges, pickle spear, sport peppers, and celery salt. The tomatoes should be nestled between the hot dog and the top of the bun. Place the pickle between the hot dog and the bottom of the bun. Don’t even think about ketchup! Today is National Daiquiri Day! If you live anywhere in the Midwest right now, you’ll be elated to know that today is National Daiquiri Day! It’s been hot out here- approaching the 100 degree mark with nearly 100% humidity is torcherous! So what’s one to do? We’ve got the solution to that- Blend up an ice cold daiquiri and relax! I am a huge Ernest Hemingway fan and even though the drink is commonly associated with this great author it is interesting to learn that daiquiris made there way into the mainstream drinking world in 1898 in the small iron mining town of Daiquiri near Santiago, Cuba by an engineer named Jennings Stockton Cox. He came up with the drink, a simple blend of lime juice, sugar and local Bacardi rum (est. 1862) over cracked ice as a way to boost the morale of mine workers during the sizzling summer months. It was such a success Cox not only received a generous stipend from the mining company but also a monthly gallon of Bacardi. Shake with ice and strain into a chilled cocktail glass. Serve frappe. Today is National Grand Marnier Day! Today is National Grand Marnier Day. Invented in 1880 by Frenchman, Alexandre Marnier-Lapostolle, it is made from a blend of true cognac and distilled essence of bitter orange. This liquor can be used to make drinks as well as delicious desserts like creme brulee and Crepes Suzette. So, in honor of this fine day make the Grand Smash after work today and enjoy your evening. Muddle mint leaves and lemon wedges in a tall mixing bar glass. Add Grand Marnier® and ice and shake vigorously. Strain over ice in a 4 oz rocks glass and garnish with a fresh mint sprig. Today is National Pina Colada Day! I like a Pina Colada! It’s National Pina Colada Day and on a hot day like this what better way to refresh your taste buds than with this delicious tropical drink. So make yourself an ice cold drink, sit back and enjoy the summer heat! This recipe is a delightful twist to the usual Pina Colada! Put all the ingredients is the Vitamix Drink Machine Advanced Bar Blender and blend until smooth! Today is National Fried Chicken Day! I love fried chicken! Okay okay! I know it’s not the healthiest thing out there but when I’m at a restaurant and they have fried chicken on the menu I can’t help but drool! The best fried chicken is perfectly seasoned with a crisp breading on the outside and dripping with juices when I bite into it! You know what I’m talking about- It’s the kind of chicken that you like your fingers and the plate after! So throw your diet out the window tonight and try your hand at preparing fried chicken for dinner! Here’s my favorite recipe. Try it out and let us know what you think! Pour the buttermilk and hot sauce in a large stainless steel mixing bowl. Roll the chicken pieces into the buttermilk mix, and then add them to the bag. Shake well until the chicken is coated with the seasoned flour mixture. Add the shortening to your frying pan and turn your Southbend S36D 36″ 6 Burner Gas Range to high . When the shortening is very hot, put the coated chicken in the skillet or fryer and turn the heat down to medium. Let it cook for about 17 minutes until it is golden brown on one side. Using 16″ Stainless Steel Tongs, flip the chicken over and let the other side cook until golden brown. Turn the heat down to low, cover the pan and cook for 10 more minutes or until the chicken is cooked through with no pink in the center. Independence Day, hanging out by the pool, drinking an ice cold drink on the patio, and 14 hours of sun light! Yep it’s July- one of the most exciting and happiest months of the year! As a kid you can probably remember spending countless hours outside with your friends running all over the neighborhood. On these hot July days, ice cream is the most perfect food to cool you down and leave you feeling completely refreshed. Arabs were the first to use milk as a major ingredient in its production, sweeten the ice cream with sugar rather than fruit juices, as well as perfect ways for its commercial production. As early as the 10th century, ice cream was widespread amongst many of the Arab world’s major cities, such as Baghdad, Damascus and Cairo. Their version of ice cream was produced from milk or cream and often some yoghurt similar to Ancient Greek recipes, flavoured with rosewater as well as dried fruits and nuts. While it may have been the Arabs who introduced ice cream to the world- the United States has definitely taken ice cream to the next level. 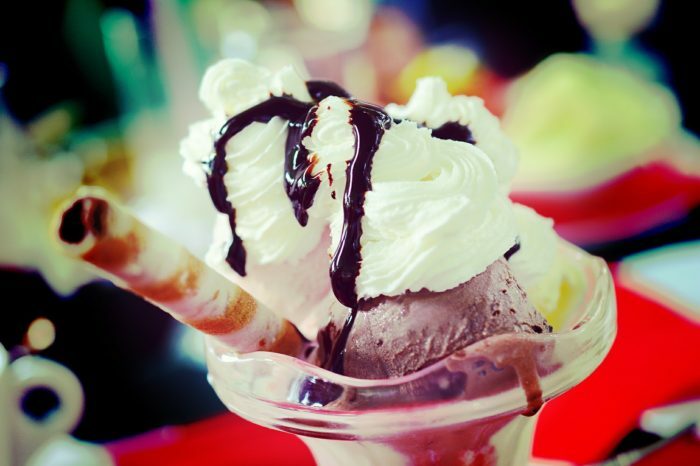 Today, Ice cream machines can be found in almost any ice cream shop, restaurant, cafe, and even gas stations. With hundreds of different flavors and garnishments it would be hard to find a person who does not like ice cream. It’s also no surprise that strawberry, vanilla, and chocolate are the most popular flavors of ice cream in the U.S. and hot fudge and caramel are the most popular toppings. You have the entire month of July to celebrate ice cream by eating it- however, take this opportunity to make your own ice cream! It’s not as hard as you’d think and you can use your creativity to make your ice cream as unique as you! Make this recipe for ice cream base and then add anything you’d like to it! Combine milk, first quantity of cream, sugar, salt and corn syrup in a large, heavy saucepan. Bring just to a boil, and then temper into the egg yolks. Pour everything back into the pan and continue to cook until the custard has thickened and coats the back of a spoon. Don’t let it boil. When ready, strain through a fine-meshed strainer into the 2nd quantity of cream. Dividing the cream helps to start cooling the base quickly and reduces the possibility of curdling due to carryover cooking. Chill and spin according to the ice cream machines manufacturer’s instructions. 2. The proportion of sugar is important for taste and texture. Prior to freezing ice cream will taste a little sweeter than it does when frozen, so take this into account. 3. Be scrupulous about hygiene. Ice cream utensils should be washed in very hot water and air dried. 4. Always clean utensils immediately after use, and preferably between batches.